Reading and share top 6 famous quotes and sayings about Negative Talk by famous authors and people. Browse top 6 famous quotes and sayings about Negative Talk by most favorite authors. 1. "Do not own negative self-talk." 2. "I had heard so much negative talk about our generation, that we're slackers and young fogies, that I knew wasn't true of the people I know." 3. "I try to explain how people react when overwhelmed by confusion and negative emotions. Some drink too much. Others overeat or beat their wives or kick the cat. And a surprising number hold their hands against a hot plate or slice open their skin with a razor blade. It's an extreme coping mechanism. They talk about their inner pain being turned outward. By giving it a physical manifestation they find it easier to deal with. (35)"
4. "You won't ever get ahead if you keep feeling sorry for yourself. 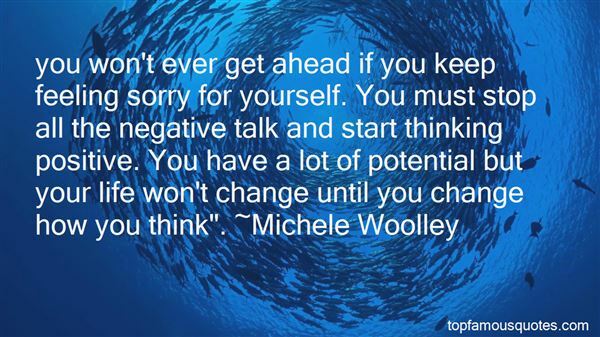 You must stop all the negative talk and start thinking positive. You have a lot of potential but your life won't change until you change how you think"." 5. 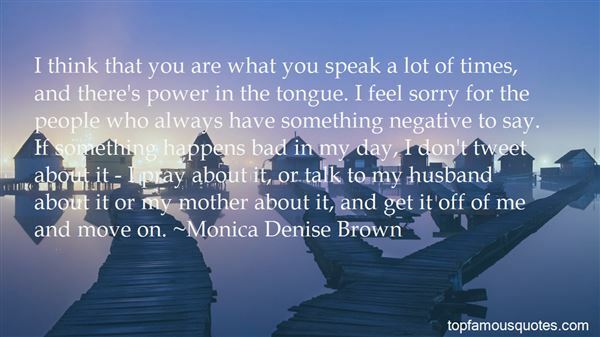 "I think that you are what you speak a lot of times, and there's power in the tongue. I feel sorry for the people who always have something negative to say. If something happens bad in my day, I don't tweet about it - I pray about it, or talk to my husband about it or my mother about it, and get it off of me and move on." 6. "You parrot negative things and squawk about the things you don't love, you are literally jailing yourself, like a parrot in a cage. Every time you talk about what you don't love, you are adding another bar to the cage and you are locking yourself away from all the good." L'amico certo si vede nella sorte incerta."